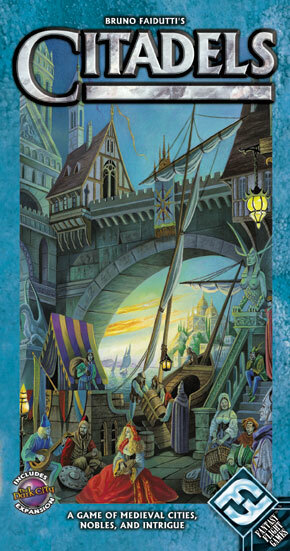 Nominated for the German Game of the Year in 2000, Citadels has finally arrived in an English language edition. Game enthusiasts of all genres will be enchanted by this wonderful game of bluffing, deduction, and city-building. Wrapped in a medival theme and gorgeously illustrated, players seek to be the first to complete a grand city of their own. Each game round players secretly take the roles of either the King, Magician, Architect, Assasin, Thief, Bishop, General, or Merchant and seek to use the powers of such offices in their efforts to win the game. As an additional bonus, the English version will ship with 10 new cards designed by Bruno Faidutti himself. These cards feature new locations and new characters to make your game of Citadels even more diverse than the original German version. Other products in the "Citadels" series. This is a great game of back stabbing. Starting with the king, each player picks a character. When everyone has selecter a character the king calls them to take a turn. The American version of the game has alternate characters to swap into the game. Each player gets an action, this is, take 2 gold or draw two cards and discard one of them. Each player can build one building per turn (if they have enough gold to pay for it). The catch? Each character has a special ability (some have two). The game ends when someone has built his/her 8th building. You score the cost of each building, and you get bonus points for having a builing of each color, having 8 buildings and going out first. This is still a favorite game in our group, playing with 7 players is the best. If you're looking for a good group game for hard-core and non-hard-core gamers alike, this is your game. This is such a fun game. The money pieces look like pieces of buterscotch candy..yum. In this game players take turns deciding which character they'll be for the round. Each character has different powers. During your turn , you take an action, then build a building/development. You won't regret buying this! This is my new favorite group game!! This game dominated our last board game night. We were going to play a variety of games but when we tried Citadels we could not put it down. It has such a variety of aspects that pleased us all - from economic management to smashing stuff this game was a hands down winner at our table. Our next roleplaying session is in danger of getting bumped for another session of Citadels - ouch! One thing we enjoyed doing was playing with alternating character decks of the old characters and the new characters - this probably causes some grevious imbalance that has game experts pulling out their hairs, but hey - we had a great time doing it! We are also very pleased that the game seems to be drawing the interest of our better halves - any game they will play with us is worth it's weight in gold! OK I am gushing but this really is a good game - try it! This is one of my favorites. the character selection system is one of the best side by side with Puerto Rico. The cards are very beautiful and the box is very small so you can take it anywhere. This is a great game to have, does not take a lot to pick up, but has a lot of variation to choose from when picking a character. Fast and fun pick this one up. This game is easy to pick up, yet has a lot of strategy when picking characters. This is a fun one that you should pick up. Citadels is one of the games responsible for my board game addiction. Highly replayable, great mechanics and strategy, easily taught, non-intimidating for new gamers, and downright fun. This is a very good light to medium weight game that is inexpensive and worth every penny. Fantasy Flight simply makes great products and this is one. Enjoy! It's really a good game for friends. Each turn you will have to choose a character secretly that can bring the best advantage for you. However, be ware someone might plan to assassinate you or steal your gold !! An extremely replayable game that works equally well for 2 players as it does 8 or more. The dynamics (and to some extent the ruleset) change drastically according to the number of players, which really adds to the versatility of the game. Lots of deception and player interaction. I played this game for the first time the other night. At first glance, the game looks like a dud considering the apparent lack of mechanics and simple design. However, I found it to be a great game with in depth thought put into every card choice. The quick set up and relatively quick game play make it a good filler or game to end the night when you need to play 1 more. Fairly simple game that interjects just enough thinking to keep me interested. The roles are key; guessing what your opponents have chosen is half the fun. This game is spectacular in that it's easy to learn the general gameplay, but very difficult to master. The psychology behind determining who would most likely pick which character each round makes this game extremely enjoyable even after years of play. A spectacular game to introduce non-gamers to German Games. A small but versatile game suitable from 2 up to 7 players. The role selection mechanism is similar to San Juan but different in that there is some secrecy/guessing involved and is somewhat like Race for the Galaxy but there is no role duplication. The expansion included is a nice bonus- more roles = more interesting game play plus the extra district cards will surely spice up the game. A simple to set up and learn game playable in about 30 minutes-45 minutes depending on the number players & how long they take to select their roles. Highly recommended. Citadels is an interesting card game where you take on different roles each round. These roles determine player order and have special powers. The goal of the game is to construct buildings which earn you points, but don't get too hasty because someone might tear it down. The only irritating thing is you might get killed or thieved from the entire game!